Even accounting for the departure of the prolific Pierre-Emerick Aubameyang for Arsenal last year, there is no shortage of goal-scoring talent in the Bundesliga. Robert Lewandowski, Marco Reus, Timo Werner and Paco Alcacer all figure highly in the German top-flight’s scoring chart. 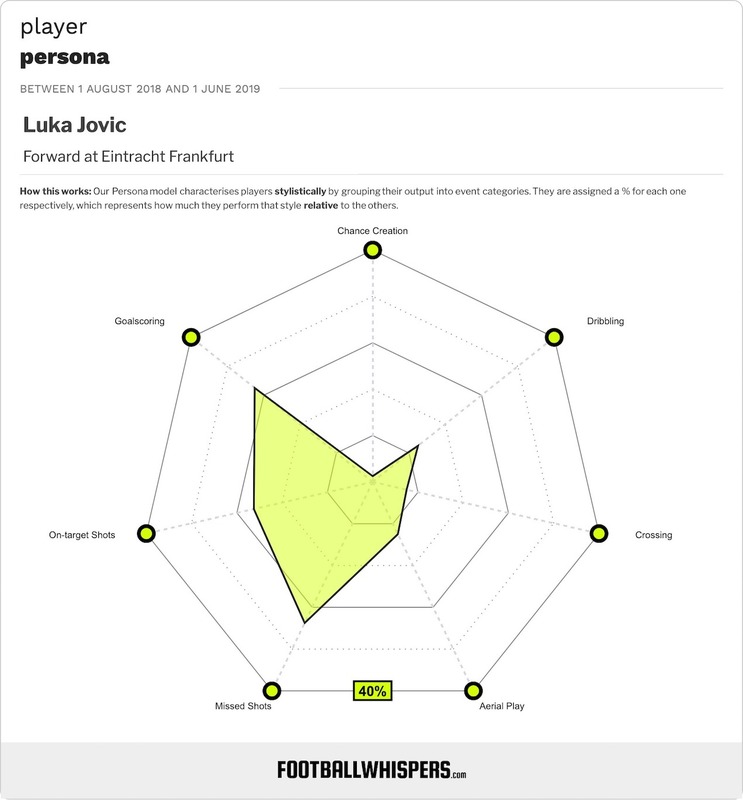 But 21-year-old Eintracht Frankfurt striker Luka Jovic tops them all, and he’d be the perfect long-term addition to Liverpool’s frontline. With 14 goals and three assists from just 14 league starts this season, and with his exploits in the Europa League taking his all-competitions tally to 19, Jovic is the hottest striker in Germany right now, reportedly wanted by Barcelona, Bayern Munich and the Reds. In the second season of a two-year loan from Benfica, Eintracht reportedly hold a buyout option in the region of £7-10million for the Serbia international; this represents a win-win scenario for the club who have given the youngster his break in a major European league: either they hold on to him and retain one of the best striking talents on the Continent, or they cash in and instantly make a huge return on their modest investment. Having been made to bide his time before becoming a regular starter at Eintracht last season, where his goals helped Niko Kovac’s men win the DFB Pokal and earn a seventh-place finish before the manager moved to Bayern, Jovic’s sudden rise to prominence may give the impression that his ascent has been rapid and without friction. That is not the case, though. An international at every youth level, Jovic was known to be one of Serbia’s hottest prospects as he was progressing through the ranks at Red Star, the club he grew up supporting, and he became a fixture in the senior side while still a teen. Indeed, at 16 he became the youngest scorer in the club’s history, and at 17 he was the youngest player to feature in the Eternal Derby between Belgrade rivals Red Star and Partizan. But the 13 goals he scored in 43 senior outings for Red Star were spread unevenly as he struggled to find a degree of consistency. And in November 2015 he became the subject of threats of physical harm aimed at extorting money from Jovic and his family. The perpetrator was soon caught, but Jovic left for Benfica less than three months later. In 18 months in Lisbon, Jovic played predominantly for the club’s B team and was never prolific. He earned just two senior appearances and indiscipline – he was spotted in a City-centre nightclub too close to an upcoming game – and homesickness put paid to his opportunities with the Portuguese club, who packed him off to Frankfurt in the summer of 2017, likely never to return. At Eintracht, though, perhaps partly due to the eastern European influence at the club – the Croatian Kovac was manager at the time, director of football Fredi Bobic is a former Germany international but was born in Slovenia, and Croatian Ante Rebic and Serbian Filip Kostic are both key players – he has been able to settle, to feel at home. And the comfort he feels in his current surroundings is borne out by his stunning performances. Despite just 929 minutes of Bundesliga action last season, Jovic scored nine goals. And this term he is finding the net at the remarkable rate of a goal every 87 minutes, forming the deadliest strike partnership in the division with Frenchman Sebastien Haller, who himself has 11 league goals and eight assists. Strong in the air and quick across the ground, one of Jovic’s great strengths is that he is genuinely two-footed, a rare trait even at football’s highest level; he takes penalties with his right foot, for instance, yet his most spectacular goals have tended to come from his left, such as the acrobatic, back-to-goal strike against Fortuna Dusseldorf and the sublime chip versus Lazio in the Europa League. Jovic’s biggest weapon, though, is his movement. Or, more accurately, his ability to stand still. Blessed with acutely accurate intuition when it comes to predicting where within the penalty area the ball will arrive, the 21-year-old has both the speed to break free from his marker and the intelligence to wait in the optimal space to receive scoring chances. Although Liverpool possess one of the most feared forward lines in world football, their current title charge has been founded on a solid defence. It is Klopp’s attacking department, in fact, that has come under scrutiny of late for failing to sufficiently break down deep-set opposition. The addition of Jovic, with his fluid movement, lethal finishing and ever-growing confidence, would be the perfect remedy to restore the Reds’ attack.